I am not 25 years old. I will, actually, be 48 years old this August. There are things a 48 year old body should not be trying to do like a 25 year old body. Don't try to fix what ain't broke. And what this all means is that doing heavy lifting and harsh movements on my body was not wise and even caused some injuries that might be more than long term. I have a jacked up calf muscle and wrist all because I was making my body do things it really didn't need to do. I proved that I could do all of the workouts, but that doesn't mean all of the workouts were what was best for my body. When I looked back over the past five or so years and identified the types of workouts that provided me with the most joy, consistency, and strength, it was running. But even with running I had to be careful. I enjoyed running when I did it consistently for about 30 minutes a day, or about 2 miles. I did not enjoy running when I was training for a certain run or trying to increase my distance or trying to increase my speed or when I was running with other people doing the same. That, I did not enjoy at all. Once running became something I had to do instead of something I got to do, it lost its allure. 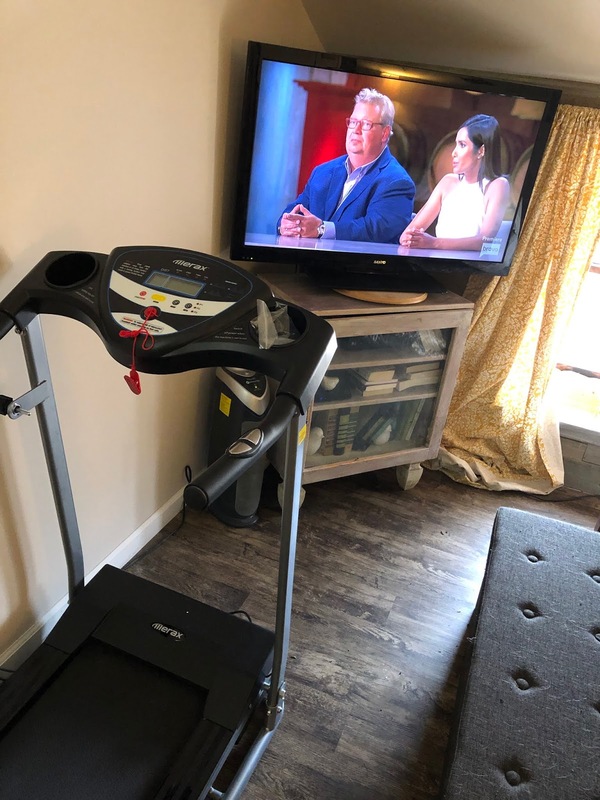 So after Christmas I bought me a cheap, compact treadmill (no bells and whistles) to have in my bedroom in front of my t.v. Yes, I enjoy running on a treadmill, especially when it's 20 degrees outside, while watching t.v. I don't dread it. I actually enjoy it. And, it gives me the opportunity to catch up on binge-worthy shows on Netflix and Hulu when I don't have the time to actually binge watch them. I just got caught up on Game of Thrones and am now watching You. I look forward to the time because I enjoy what I am doing. And some days, when I have just been sitting too much (which is most days because I work at my desk at home 6-9 hours a day), I just hop on my treadmill for a midday 15 minute speed walk to get my body moving. Every once in a while I get in the mood for a strength routine. When that (rarely) happens, I get on Youtube and pull up a Pop Sugar workout routine (aka FREE Beachbody, because the workouts are virtually the same without the annoying trainers). I can do anywhere from 10 minutes to an hour depending on what I am wanting to accomplish. And when the weather gets nicer, I will get back out and run on the pavement. Fresh air is nice. And I like to ride my bike on the trails, so I will make that more of a priority this spring and summer. Other than just taking the stairs, parking as far away from the entrance to a store as possible, and walking to in-town errands when the weather is nice, that's all I am doing right .... 30-40 minutes a day of low impact (because I am 47 years old, not 25) walking and running while trying to eat healthy 70% of the time. But that's for another post.